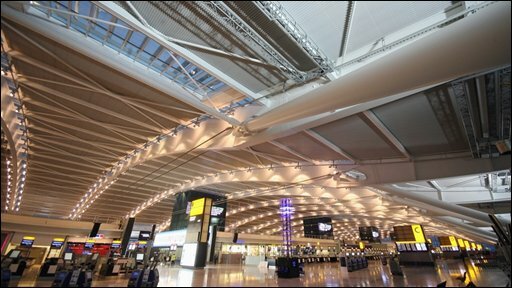 The chaotic opening of Heathrow Airport's Terminal 5 showed "serious failings" by British Airways and airport operator BAA, MPs have said. The event in March was a source of "national embarrassment", the House of Commons Transport Committee said. It said the problems, which included cancelled flights and thousands of bags going missing, "could and should" have been avoided with better planning. The companies have apologised and said the situation had improved since then. Committee chairwoman Louise Ellman MP, said: "What should have been an occasion of national pride was in fact an occasion of national embarrassment." When the £4.3bn terminal opened on 27 March, most of the problems were down to "insufficient communication" between British Airways (BA) and BAA, the report found. It also criticised poor staff-training and system-testing by the airline company. The 36,584 passengers who turned up on the first day faced long queues and had little idea about what was happening. "When the baggage system failed, luggage piled up to such an extent that it was transported by road to be sorted off-site. "According to BA, 23,205 bags required manual sorting before being returned to their owners," the report said. MPs said they were "astonished" BAA and BA only decided to organise joint meetings once things started going wrong. It was "deeply regrettable" these meetings had not taken place before the T5 opening, the report said. Mrs Ellman said: "We were struck by how much 'hoping for the best' BAA had engaged in prior to the opening of T5". MPs spoke to the Unite union and the companies. BAA's chairman Sir Nigel Rudd and chief executive Colin Matthews, who appeared before the committee, were criticised for being "unhelpful and ill-prepared" and not being able to provide any "satisfactory explanation" about why the chaos had happened. 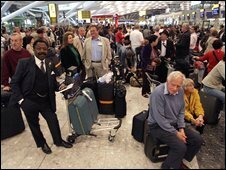 "The opening of T5 revealed serious failings on the part of both BAA and BA. "Like both organisations, we acknowledge the inevitability of 'teething problems' but deeply regret that so many were allowed to bring the operation of Heathrow's newest terminal to a halt," the report concluded. The Competition Commission's provisional report on UK airport ownership, recommended the sale of some of BAA's seven UK airports, including Gatwick, Heathrow, Edinburgh and Glasgow. The MPs said: "This reinforces the view we have previously expressed, that BAA is a monopoly that needs to be broken up." A BAA spokesman said the company had noted the findings and re-apologised. He said lessons had been learned and changes made. He claimed the airport was now exceeding many performance targets and was rated highly in satisfaction polls by many of the 11.5m passengers had already passed through. He said: "We acknowledge that the committee did not get all the answers it wanted at the first hearing. "We focused on fixing the problems at T5 and not investigating until those problems were resolved once and for all. "Had we diverted our resources to investigating rather than solving the problems, we could not have fixed them as quickly as we did." A BA spokesman accepted the opening days were "disappointing" and said the company had apologised many times for the disruption. He said: "T5's opening is history. Its present is a great success. We are resolutely committed to keeping it so." He also pointed out the airline had improved its performance, customer satisfaction, and punctuality targets during the past seven months. Conservative shadow transport secretary Theresa Villiers called the report "damning" with passengers badly let down. Liberal Democrat shadow transport Secretary, Norman Baker, said the findings proved BAA was a "complacent organisation" which had put profit ahead of its passengers. What did go wrong at Terminal 5?